For eyewitness descriptions of incidents, see Cook, Banks and Parkinson Journals, and also Hawkesworth under ‘Voyaging Accounts’ at the excellent South Seas web pages of the National Library of Australia. The actual handwritten pages from Captain Cook's Journal can be viewed online at the National Library of Australia. Day by day they bring the whole adventure to life. Joseph Banks's Journal can be seen at the State Library of NSW. Books and authors mentioned in these Chapter Notes will be found on the References page. The prefix Adm indicates an Admiralty series document held at the British National Archives. Black hand. The Manley family crest dates to mediaeval times. John Manley’s shield can still be seen in Middle Temple Hall where Shakespeare's Twelfth Night was first performed . London Bridge. The first stone bridge over the Thames was opened in 1209 and stood for over 600 years. The second London Bridge opened in 1831, and the most recent in 1973. Baldwin’s Guide of 1768 gives the watermen’s rate from London to Deptford as two shillings and sixpence (half a crown). Shooting the Bridge. The dangers were very real (Jackson pages 70-1). Manley family. Isaac was descended through the younger branch of a landed family from Erbistock, in Wales. His great-great grandfather, John, fought for Cromwell and was an MP. His great-grandfather, Isaac, was Postmaster-General in Ireland, and grandfather, John (died 1743), was a Commissioner for Customs and lived at Hatton Garden. His father, also John (c 1716-1801), was called to the Bar in 1739 and became a Bencher [senior member] of the Middle Temple in 1768. In 1750 he married Ann Hammond and they had five children. Isaac George Manley. Baptised St Giles-in-the-Fields, London, 3 March 1755. Given high infant mortality rates, most children were baptised quickly and Isaac would have been born about this date. His elder brother John, and younger brother Robert Kenrick both entered the 33rd [Lord Cornwallis’s] Regiment. Isaac had an elder sister Maria, and a younger Louisa, both apparently unmarried. It’s not known where the children went to school: possibly the family had a tutor. Servant. Isaac joined Endeavour 17 June 1768. Beaglehole Life (page 139) gives Isaac’s age as 12, but this is incorrect: he was 13 years and three months It is unclear how Isaac got a place on the ship but his father had connections with the Royal Navy. For example, in 1790 Isaac wrote to the Secretary of the Admiralty, Sir Philip Stephens, My father desires his compts [compliments]. Stephens had begun his career at the Navy Office, near the Customs House where Isaac’s grandfather was a Commissioner. Service with an officer was a not uncommon way for young gentlemen to enter the Royal Navy. London. I have used the facsimile of John Roque’s Plan of 1746. Tahiti. The modern spelling. Cook and others used the archaic Otaheite. Wallis called it King George’s Island. I have used modern spelling throughout Captain Cook's Apprentice. HM Bark Endeavour. Built in 1764 as a coal ship at Whitby, Yorkshire. A cat-built (deep-waisted) bark of three masts, square rigged, she weighed 368 tons, had an extreme length of 97ft 7in (29.7m), and was 29ft 3in (8.9 m) at her widest (Parkin page 4). She drew about 14ft of water (less than 2.5 fathoms) laden. Originally the Earl of Pembroke, renamed HM Bark Endeavour when bought by the Royal Navy in 1768. James Cook. One of the world’s greatest navigators. Born 1728 at Marton, Yorkshire, son of a Scottish farm labourer. At 17 he was apprenticed to a Staithes grocer, but subsequently transferred to a Whitby coal-shipper, the Quaker John Walker, where Cook learned his seamanship. In 1755 he joined the Royal Navy, and received high praise for his survey of the St Lawrence River in Canada during the Seven Years War. His later survey of Newfoundland and observation of an eclipse brought him to the attention of the Royal Society, the Admiralty, and his appointment as Lieutenant to command Endeavour. Nick Young. Described in the Endeavour Journals by Molineux October 1769 as about 12 years old. Gore calls him ‘a little boy’. HMS Dolphin. The Dolphin made two voyages around the world: with Captain Byron (1764-66), and Captain Wallis (1766-68), who discovered Tahiti. His glowing accounts encouraged the Royal Society to select the island for the Pacific observation of the Transit of Venus. Master. The senior non-commissioned officer and one of the most important roles on an 18th century ship. The modern equivalent would be that of navigator, although a Master’s responsibility for the internal management of the ship was much broader. Isaac would have learned his craft from topmast to keel. Sauerkraut. Literally ‘sour cabbage.’ A European dish of sliced fresh cabbage, salted and fermented by various lactic acid bacteria. It keeps well and retains much of its Vitamin C, an important factor in overcoming scurvy during long sea voyages. Cook received the Copley Medal in 1776 for demonstrating its efficacy. See Cook Journal 13 April 1769 for his psychology in getting the crew to eat it. Endeavour. My descriptions of life aboard the ship are based on an eight-day sail I made on the Endeavour replica from Melbourne to Sydney in April 2006, and visits to the ship at the Australian National Maritime Museum, Sydney. Captain Ross Mattson and his crew willingly showed this landlubber his ropes. Hammock. I slept one night in a hammock in the low part of the deck. It was enough. Storm. Cook 1 September 1768. Weather sayings. From a collection at the Maritime Museum, Falmouth, UK. Net. Banks Journal 5 September. Weir. Cook 14 September. Flogging. 16 September. Beef. To conserve supplies, salt beef was not eaten every day at sea. Non-meat days were known as ‘banyan days’. Scurvy. The physician James Lind wrote in 1753 on the value of citrus in preventing scurvy, but little notice was taken at first. Cook helped show that, apart from sauerkraut, the real antiscorbutics were fresh food, greenstuffs, and above all citrus. Once this was understood, every British ship carried lemons and limes – hence the term ‘Limeys’ (Brown, Rodger pages 100-103, Beaglehole Life pages 135-6). St Nicholas. Author visit, October 2006. The skull and crossbones can still be seen on the gateposts, also the charnel house. Thurman. Beaglehole Journal Volume I p 596 ‘The Ship’s Company.’ I assume Thurman was taken ashore, as press gangs also boarded merchant ships (Rodger page 180-2). Bully boys, Bullies. ‘Fine boys, hearties.’ Originally a term of affection or comradeship, and used in this sense. No doubt actions such as the press gangs led to its current tyrannical meaning. Crossing the Line. Banks 25 October describes the ceremony. Rio. Cook 13-30 November. A ‘paper war’ broke out between Cook and the Governor over the refusal to let Endeavour crew ashore, which the Captain took as an insult to himself and the British Crown. Like most of these engagements it was hot and angry but ultimately futile – and Cook was careful not to let any stray shots sink his expedition. Sneaking ashore. Banks 22-26 November. Jails. 20 November. Flogger flogged. Cook 30 November. Flower. Cook 2 December 1768. Watches. A ship’s 24-hour day started at noon, a time easily fixed when the sun is at its zenith. From midday, under a three-watch system all watches are of four hours except the two late afternoon ‘dog watches’ which are each of two hours. Without them, every watchman would be on duty at the same time every day. ‘Dog’ may be a shortened term for those said to be ‘dodging’ a full watch. With a two-watch system there are no dog watches. The crew serve four hours on duty and four hours off. The watch is not only necessary for the safety of the ship. With the daily routine it provides structure, meaning and occupation for the lives of sailors, helping to prevent minds from becoming idle, bored and mischievous. Giants and pigmies. See Hawkesworth Introduction, also Byron and Wallis sections. Indians. The Endeavour journals usually refer to any native peoples as Indians. I have kept the practice here in direct speech. Fearnought jackets. Cook 6 January 1769. Guanaco. Animal similar to a llama. Deaths. Based on Banks 16-17 January. Slaves. It is estimated 9.5 million African slaves were transported to the Americas during the 18th and early 19th centuries. England stopped her slave trade in 1807, and abolished it altogether in her colonies in 1834. Nails. See Wallis July 1767 in Hawkesworth. Goat. Ibid page 313. Greenslade. Cook, Banks 26 March. Plantain. A tropical fruit, similar to a banana. Rules. Cook 13 April. Thieves. 14 April. Shooting. 15 April. Buchan. Banks 16-19 April. Nick Young. Mustered 18 April (Beaglehole Journal Volume I p 600). Flags. Cook 12 June. Dog. Cook 20 June, Parkinson page 20. Heiva. Banks ‘Manners and Customs of South Seas islands’ Journal following 14 August. Doll. Cook, Banks 28 April. Quadrant. 2 May. Mutinous talk. Molineux Endeavour Journal 5 May, and Trip around island. 8 May. Surfing. Banks 29 May, the first European description of the sport. I assume Isaac also saw it. Rats. Molineux 26 May, Parkinson page 21. Transit. Cook 3 June. The Transit occurs in pairs, eight years apart, separated by approximately 120 years. It occurred in 1761 and 1769, 1874 and 1882, 2004 and will again in 2012. Astronomers calculated the Earth’s distance from the Sun using the principles of parallax – i.e. by measuring the slight apparent shifts in the track of Venus across the Sun as seen from different parts of Earth. Hence the importance of the Tahiti sighting (see Lomb). Observation. For Cook’s description see for example ‘Endeavour project’ www.coombs.anu.edu.au. I have assumed that direct observation through the reflecting telescope (with dark filter glass) and projection onto a card or screen were both used. WARNING NOTE: It cannot be stressed too strongly how dangerous it is to observe the sun with the naked eye. Even using a dark glass is not acceptable. Always make an observation under supervision and with correct equipment. Teredo. A shipworm found in tropical waters which bores into timber hulls, piers etc. Tattoo. Cook ‘Description of King George’s Island’ Journal following 13 August, Banks 5 July and ‘Manners and Customs’, Parkinson page 25. Wolf. Cook 4 June. Banks & Monkhouse. Parkinson, 19 June page 32. VD. Cook 6 June. It seems gonorrhoea was the venereal disease brought to Tahiti. The widespread tropical disease of yaws can give some immunity to syphilis. I have used ‘pox’ as period slang to include any form of VD: ‘distemper’ is Cook’s word. As he foretold, it spread through the Pacific with other diseases introduced by Europeans – measles, smallpox, even the common cold – that devastated indigenous communities (Beaglehole Life page 188, Salmond  page 69). Thurman. Cook 12 June. How Thurman must have regretted going to Madeira! Marae. Banks 13, 18 June. Boy chief. Cook 21 June. Rake. Cook, Banks 14 June. Island tour. 26 June-1 July. Marines. Cook 10-11 July. Despite his punishment, Gibson had much respect for the Captain, as Cook did for him. Gibson sailed as Corporal on Cook’s second voyage, in the Resolution, and as Sergeant on the third voyage. He was with the Captain when Cook was killed by natives at Hawaii in 1779. Tupaia. ‘I do not know why I may not keep him as a curiosity, as well as some of my neighbours do lions and tygers…’ Banks 12 July. Heimata. A popular Tahitian name, it means ‘crowned with eyes’, a clairvoyant. Quarrel. Bootie Endeavour Journal July 1769. The torn-out page has been re-inserted in the wrong place. Evil communications is from the Bible, 1 Corinthians. It is unclear if Nick wrote the words himself, as the hand seems rather mature for a 12-year-old. Orders. Beaglehole Life pages 147-9). Tupaia’s map. Cook’s drawing based on Tupaia’s map is at the British Library, London (see Aughton pages 132-3). Alexander Dalrymple. Scottish geographer (1737-1808), a believer in the southern continent. In 1767 he published An Account of Discoveries in the South Pacifick Ocean previous to 1764, a copy of which he gave to Banks. The Royal Society proposed Dalrymple command the Endeavour expedition, but as he was not a Royal Navy officer the Admiralty gave the post to Cook, and the two became rivals (see Robson, also Torres note Chapter 11 of Captain Cook’s Apprentice). Mat sails. Could be tilted fore and aft, much like a modern windsurfer. Ceremony. Cook 17 July. Possession. 21 July. Taiata. Parkinson did a fine drawing of him (page 218 of Captain Cook’s Apprentice). Smoking. The muster book shows Isaac was first charged 19 shillings for two months’ tobacco in September 1769. By February 1771 it had increased to 28 shillings and sixpence. Reading. Cook 28 August. Comet. 29 August. Supplies. Banks 23 September, also weevils. He notes they have 17 sheep, four or five fowls, as many Muscovy ducks and Tahitian hogs, an English boar and sow with litter. The goat is not mentioned. The sauerkraut is as good as ever. Reward. Parkinson page 85 says Cook offered two gallons of rum if land were discovered at night! Land of Promise. Banks 1 October. Poverty Bay. Account based on Salmond, Cook, Banks and especially Monkhouse (9-12 October). Cook does not name the four boys with the yawl, I assume Isaac was there. Maori names. See Salmond  pages 116 and 119. Tattoo. Monkhouse. Rock. Called Toka-a-Taiau, it has been removed for navigation. 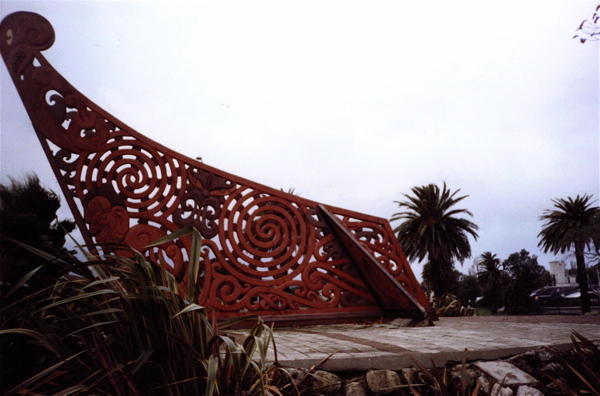 A fine memorial at Gisborne, in the form of a Maori canoe prow, overlooks the site of these tragic encounters. Homeland. The first canoes carrying the Maori ancestors reached New Zealand around AD 1000 from central Polynesia, which includes the Society, Marquesas, Cook and Austral Islands. The homeland is now generally known as Hawaiki. Banks spelt it Heawye, and the name Hawaii has the same origin. The island of Ra’iatea was also once known as Havai’i, Salmond  page 37. Maori. The first Maori settlers lived by fishing, gathering, cultivating sweet potato (kumara), and hunting the large ostrich-like moa bird that became extinct. The second phase of development from about 1350 was marked by more intense agriculture and fortified settlements (pa) especially in the North Island, reflecting greater population pressures and competition for resources (Bellwood page 416). Maori boys. Banks 10 October gives their names as Taahourange, Koikerange and Maragooete, aged about 18, 15 and 10. Censure. Cook’s defence 10 October. Arse. Monkhouse in Beaglehole Journals Volume I page 576. Kidnappers. Cook et al 15 October. At a symposium ‘Discovering Cook’s Collections’ (National Museum of Australia, July 2006) Paul Tapsell of the Auckland War Memorial Museum gave important insights into the motives behind the seizure of Taiata, and also the significance of Tupaia. Whitianga. Author visit and discussions with Peter Johnston of the Ngati Hei people, May 2006; Salmond . A video Twelve Days, produced for the Mercury Bay District Historical Society gives an interesting Maori and Pakeha perspective on Cook’s time at Whitianga. I climbed to the pa site on Whitianga rock. Te Horeta. See Beaglehole Life page 206, and Salmond  pages 131-2. Kauri. Cook 21 November. Bay of Islands. 30 November. Terrors of shipwreck. Banks 5 December. North Cape. Curiously, at the very time Endeavour was sailing west around the cape, she passed the track of the Frenchman, Jean de Surville (1717-70), who was sailing east in the St Jean Baptiste. Storms kept the ships from sighting each other, though conditions might have turned even more blustery had the rivals met. However de Surville was in bad shape, with 60 men dead and the rest of his crew so weak with scurvy they could barely handle the boats. The French put into Doubtless Bay on the east coast of New Zealand, but left after conflict with Maori, and de Surville drowned off Peru (Beaglehole Life page 211, also www.history-nz.org). Cannibal Bay. Cook named it ‘Ship’s Cove’, as it is still known. The name ‘Cannibal Bay’ appears in several log books and Parkinson p 117, also the map of New Zealand in his book Plate XXV. Author visit with Peter and Takutai Beech, May 2006. Topaa. Banks 29 January 1770 gives his name, also Salmond  pages 145-6. Human arm. Banks 16 January records the conversation. Topaa’s forearm. Cook 17 January. Heads. Banks 20 January. Buys one. ‘Account of New Zealand’ (Journal 30 March). Upper arm muscles. Professor Adrian Horridge supplied this interesting detail. He got it from an old lady in New Guinea. 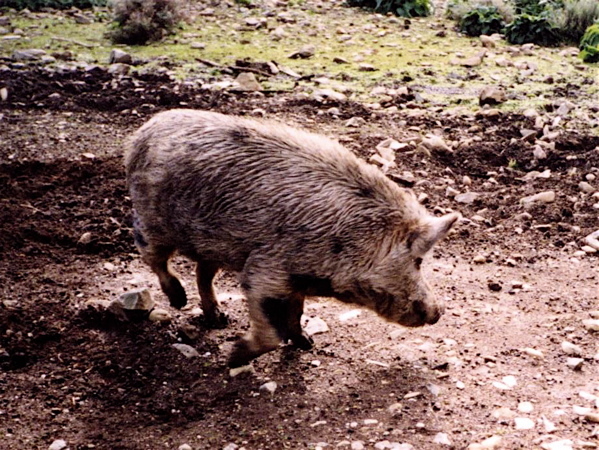 In his later visits, Cook landed goats and South Sea hogs in New Zealand to provide alternative sources of red meat. Betty Rowe has some of their descendants at her sanctuary on Arapawa Island in Queen Charlotte Sound. The pigs are still called ‘Captain Cookers’, as they are in North Queensland. Cook Strait. Banks 6 February. Possession. Cook 31 January. Portuguese. A probable 16th century Portuguese or Spanish helmet has been found in Wellington Harbour. Peter Beech tells of the Rewharewha sickness, possibly measles, caught by Maori from the sailors of a ship which visited the Sound long before Cook, maybe one of Christopher de Mendonça’s fleet in the 1520s, (see note East Coast Chapter 9 of Captain Cook’s Apprentice). Some say the spotty symptoms resembled the pattern found on pottery from this ship, others that it was like the flecked grain of the rewarewa tree. Many sailors are said to have been killed after trying to steal Maori women as their ship left. An epidemic of Rewharewha (coughing sickness) killed many Maori in the 19th century. Cape Turnagain. Cook 9 February. Longitude. I commend Sobel’s book to all interested readers. By general agreement, the prime meridian from which longitude readings are made runs through the Royal Observatory, Greenwich. Visitors to John Harrison’s three sea clocks and chronometer at the Royal Observatory are conscious of a great man (not forgetting Lieutenant Commander Rupert Gould who restored them). Cook’s chronometer, made by Larcum Kendall after Harrison, is displayed at the National Maritime Museum, Greenwich. The Nautical Almanac, first published in 1767 by the Astronomer Royal Nevil Maskelyne, halved the time it took to work out a ‘lunar’ – but it only contained tables to the end of 1769. Those for 1770 and 1771 were not completed until after Endeavour left England (Howse and Sanderson). Aerial fabric. Banks 10 March. Regret. 14 March. Westward route. Cook 31 March. Whistle. Falconer writes in 1769 of superstitious seamen being ‘afraid of the dreadful consequences of whistling in a storm’ (entry on Midshipmen). Whistling is still prohibited on Her Majesty’s ships, as it can be confused with piped orders by the Bosun: the Bosun’s call. Many other vessels (including the Endeavour replica) also frown on whistling as bad luck. Point Hicks. Cook 19 April. The date is sometimes given as 20 April, to account for the modern International Date Line. Parkin offers a splendid narrative of Endeavour and its journey up the east coast of Australia. East Coast. It is quite possible that other European navigators explored the east coast of Australia in the centuries before Cook. Trickett, among others, supported by some archaeological evidence, argues that it was secretly charted by the Portuguese captain Christopher de Mendonça in 1522-23, but that his purloined maps were wrongly aligned by French cartographers working at Dieppe in the mid-16th century. Mendonça may also have charted Australia’s west coast and much of the North Island of New Zealand. Knowledge of these maps was limited, and they tended to be overlooked by later explorers or ignored by other colonial powers. Some think Cook may have seen a Dieppe map in the British royal collection, but surely he would have said so! He credited the Dutch explorers with their earlier discoveries. Whatever the truth, it remains the case that before Cook few published maps showed an east coast of New Holland: after Cook they all did. And the modern histories of Australia and New Zealand still begin with Cook’s Endeavour voyage, the territorial claims he made for the British Crown, and their subsequent colonisation. Station pointer. There is much Cook and Endeavour material, including nautical instruments, domestic items and Cook’s Bible, at the State Library of NSW (see www.sl.nsw.gov.au). Leadline. The line was marked as follows: 2 fathoms, two strips of leather; 3 fathoms, three strips of leather; 5 fathoms, a piece of white duck [material]; 7 fathoms, red bunting; 10 fathoms, leather with a hole; 13 fathoms, blue serge; 15 fathoms, white duck; 17 fathoms, red bunting; 20 fathoms, a piece of line with two knots, and so on. The depths between the marks were estimated as ‘deeps’. Isaac Smith. A cousin of Cook’s wife, Elizabeth. Born 1752, Post-Captain 1787, Rear-Admiral 1807. In later life he lived in London and at Merton Abbey with Mrs Cook, and died in 1831. What may be a portrait of Isaac Smith in old age is at the Cook Birthplace Museum, Marton. Gamay. Sometimes spelt Kamay, the Aboriginal name for Botany Bay. It means ‘fresh water’, perhaps a reference to the stream where Endeavour watered. 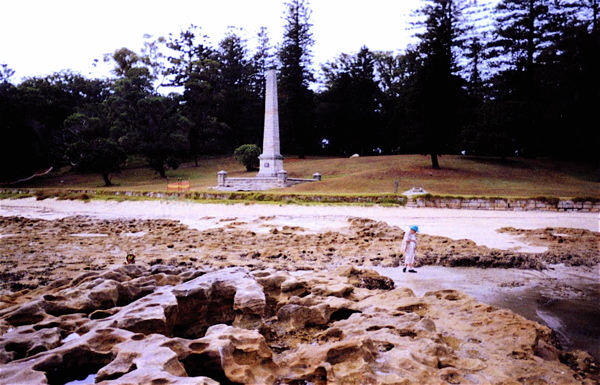 See also the website The Archaeology of the Dharawal People of NSW at www.lesbursill.com. Mr Bursill is a senior member of the Dharawal community. Endeavour's stay at Botany Bay see Cook and Banks's Journals 29 April to 6 May 1770. The National Library of Australia has Cook's journal online. The State Library of NSW site features pages from Banks's journal. Punishment. Being made to stand in the rigging or at the masthead were common punishments for the boys and young gentlemen – short of being tied over a cannon and beaten with a cane or a cat-o-five-tails ('Kissing the Gunner’s daughter'). James Magra. Born New York 1746, died 1806. Later changed his surname to Matra, joined the British diplomatic service, and in 1783 wrote a pamphlet proposing a settlement in NSW, later taken up by Banks. The Sydney suburb of Matraville is named after him. Orton. Cook 23 May 1770. Fothering. Parkinson gives the detail that the fothered sail was lowered over the bows and hauled aft by ropes until it was sucked into the leak. Bower anchor. The small bower anchor was recovered in 1971, and is now on display at the fine James Cook Museum, Cooktown, with one of the cannon raised in 1969. Sheathing. See Parkin p 71 and commentary for 22-24 June. Mangrove pod. Alan Gould in his poem The Great Circle gives a lovely image of Endeavour on the river mud like a cast-up pod. Kangaroo. Cook and Banks spelt it kanguru, I used gangurru from today’s Guugu Yimithirr spelling. Gore shot his first specimen on 14 July. Turtle hunt. Cook 9 July says that only a boathook was used. Bama. A written statement by Eric Deeral displayed at the James Cook Museum, Cooktown, and the beautiful Milbi Wall by the waterfront, give a valuable Guugu Yimithirr perspective on Endeavour’s time at the river and Aboriginal culture. Ngamu Yarrbarigo. Eric Deeral gives the name of the elder. Pickersgill. I assume he went to the opening, still called Cook’s Passage, as none of the journals say which Mate it was. Quit this coast. Cook 13 August. Sweeps. See Parkin’s detailed commentary on the events of 16-17 August. Manley Island. Named much later for Isaac. It is among the small Cockburn Islands off Cape Grenville, Far North Queensland. Torres. The Portuguese navigator’s 1606 track south of New Guinea appears on Dalrymple’s map. Banks had a copy on Endeavour. Bearings. It is extraordinary how close to the true position was the latitude and longitude given by Cook. It is said a satellite photograph could be laid almost exactly over Cook’s chart of the east coast. New Britain. An island off New Guinea, named by Dampier in 1700. Cook was to name another island New Caledonia (the Latin name for Scotland) in 1774. New South Wales. Cook’s first names are illegible. He called it New Wales for quite some time. Beaglehole Life page 249 notes that South was added after a copy of the Journal was sent to the Admiralty from Batavia in October. Swallow. The sloop HMS Swallow reached England in May 1769. Date. In September 1769 Cook crossed what is now the International Date Line east of New Zealand, but did not adjust his tally of the days. Batavia. Parkinson gives an excellent description of Batavia, now part of the Indonesian capital Jakarta. Bougainville. Louis Antoine de Bougainville (1729-1811) led the first successful French circumnavigation of the globe. He was in Tahiti early in 1768, and Batavia later that year. The island of Bougainville and the tropical plant bougainvillea are named after him. The Tahitian who sailed with him, Ahutoru, was feted in Paris, stimulating European ideas of the ‘noble savage’ (Salmond  page 53). Malaria. The term literally means ‘bad air.’ It was not until 1898 that Sir Ronald Ross proved the disease was spread by female Anopheles mosquitos. In his paper on malaria in Batavia in the 18th century, der Brug suggests fish ponds were the most likely breeding grounds, but stagnant canals and the mangrove swamps also contributed. The figures quoted are from der Brug. Banks 'Some Account of Batavia' 24 December gives a graphic account of the filth dredged from the canals. Cinchona. Banks 13 November. From the 1640s, bark of the Peruvian tree had been known in Europe as effective against malaria or ‘ague’. The active ingredient, quinine, was finally extracted in 1820. Cinchona trees were not grown in Java until the 1850s. Nick Young. Remustered as Perry’s servant on 6 November. Laudanum. A tincture (weak solution) of opium, used to relieve pain and diarrhoea since the 17th century. Its addictive properties were recognised in the 19th century. Taiata. His death is based on Parkinson page 182. Dead men’s clothes. Chris Donnithorne says that even until recently the clothes were sometimes sold several times over to raise more money for the deceased’s family. Princes Island. Both Cook and Banks 6 January 1771 note the warnings about the brackish water. Green. Cook’s comment 29 January that Green’s manner of living ‘greatly promoted the disorders ... which put a period to his life,’ is similar to his remark about Tupaia. Censoriousness of his dead is one of the Captain’s less pleasant traits. Calamitous situation. Cook 31 January. Promotion. The muster book shows Isaac became a Midshipman 5 February (Adm 36/8569). Rossiter. Cook 21 February. Gripes. 15 March. Midshipmen. See Elliot page 30 for a midshipman’s account of how Cook trained him. Log line. A knot tied at every 7 fathoms is based on the length of a nautical mile converted to feet per second. The number of knots passing over the stern in 30 seconds (later 28 seconds) as measured by the sand glass give the ship’s approximate speed, not the distance travelled. Thus, 3 knots are equivalent to 3 nautical miles per hour. A nautical mile is 1.15 times longer than a land mile. Cape Town. Banks following 7 April gives an excellent Account of life at Cape Town in 1771. Water. Cook 15 March, notes ships from Batavia all had flux, yet none had taken on water at Princes Island. Many arrived in a worse state than Endeavour. Molineux. Cook 16 April. Details of the Master’s decline are imagined. His will can be seen on the website www.captaincooksociety.com. His executors were a shipwright and a carpenter, and it was witnessed at ‘the folly’ [tavern?] near Rotherhithe on 18 July 1768, a fortnight before Endeavour left the Thames. This at first led me to think Molineux was a somewhat coarse ‘tarpaulin’ [an officer who rose from the common seamen], but his portrait found later at Otago clearly shows a rather refined, gentlemanly face (see page 14 of Captain Cook’s Apprentice). Interestingly, Otago Harbour was called Molineux Harbour by Cook, which explains why the portrait is at Otago University. It was acquired from the Molyneux family – note the spelling difference. Robert does not use ‘y’ in the signature on his Journal (Adm 51/4546 page 315) Rt Molin’x (it is ‘i’ or perhaps ‘e’) and Cook’s chart says ‘Molineux Harbour.’ This is the spelling now generally adopted, as does the online will. Circumnavigation. Endeavour crossed longitude 0 degrees on 29 April. Swallow. See Captain’s logs (Adm 51/956 and Adm 51/4562). Hicks. John Gore became First Lieutenant, and Charles Clerke Second Lieutenant. Both sailed with Cook on his third voyage, and both commanded the Resolution after his murder at Hawaii in 1779. Clerke was Captain until his death from tuberculosis off Petropavlovsk, Siberia, and Gore brought the ship home. Whaler. Cook 19 June. Weather stays. 22 June. Bets. 7 July. Nick Young. Banks 10 July. Cook letter. 8 August 1771, Beaglehole Journals Volume 1 page 736 (Adm 1/1609). Isaac on Resolution. Beaglehole Journals Volume II page 874 (Adm 36/7672). Endeavour results. Robson page 45 says about 30,000 botanical specimens returned in Endeavour, and 110 new genera and 1300 new species had been identified. See also Beaglehole Life page 273. Goat. It apparently went to Cook’s house at Mile End, London, but only lived a few weeks. Dr Johnson’s Latin verse in translation reads: The globe twice circled, this the Goat, the second to the nurse of Jove, is thus rewarded for her never-failing milk (Beaglehole Life page 291). Banks had it inscribed on the goat’s silver collar. Resolution. Cook sailed Resolution as Commander (1772-75) with HMS Adventure; and again as Post-Captain on a third Pacific voyage (1776-80) with HMS Discovery, during which Cook was murdered at Hawaii 14 February 1779. Banks’s temper. ‘He swore and stamped upon the Wharfe like a Mad Man, and instantly ordered his servants and all his things out of the ship’ (Elliot page 7). Endeavour. After Cook, she was used to carry freight to the Falkland Islands, and was sold by the navy about 1775. There are several versions of her fate. Most recently it is thought she was renamed Lord Sandwich, used to transport troops to New York during the American War of Independence, became a prison ship, and was scuttled with 12 other ships off Newport in 1778 to protect shore batteries from an approaching French fleet. A number of these wrecks have been found, although Endeavour has not yet been identified from particular features of her timber construction. Whether she will ever be raised is a subject of continuing discussion (Rhode Island Marine Archaeology Project www.rimap.com). Gore & Young. Beaglehole Journals Volume I ‘The Ship’s Company’ pages 595, 600. Isaac’s Career. Isaac George Manley Memorandum of Services (Adm 9/1 page 53). See also References under Manley for Captain’s letters and ships’ logs. The Saintes. 9-12 April 1782 (Hannay, pages 276-280, also Wikipedia entry online). Isaac’s letters. Captain’s letter 7 July 1790 (Adm 1/2126). Marriage. Burke page 1268. Braziers. See Cross for an excellent account with photographs of Braziers’ history, including the Manley years. A stone in the cellar is dated 1688. Drawings of Isaac’s additions were displayed at the Royal Academy in 1799. Isaac’s son sold the property in 1851. The author Ian Fleming, creator of James Bond, grew up at Braziers. 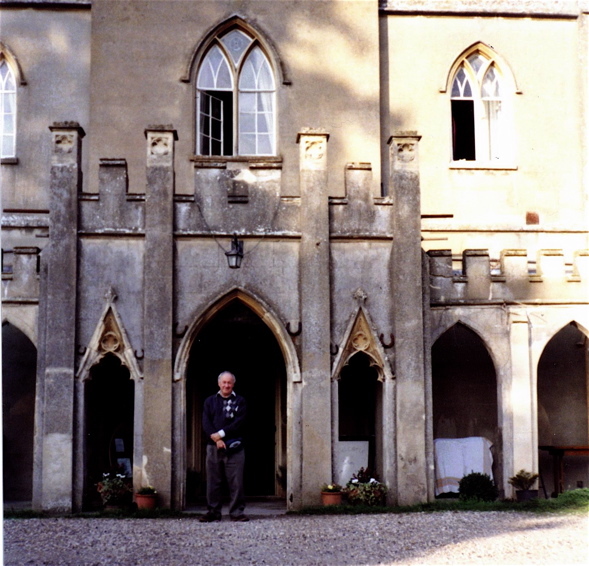 Since 1950 the property has been owned by the Braziers Park School of Integrative Social Research, where I spent three happy days in October 2006. Captain John Manley. Died 1 March 1799, without surviving children. His father records in his Will that he laid out £1250 to equip his eldest son as an officer in Lord Cornwallis’ 33rd Regiment: a vast sum for those days. As a lawyer, John Manley senior seems to have had a professional association with the Cornwallis family. He died 5 September 1801 (Will at www.nationalarchives.gov.uk). Isaac’s younger brother, Robert Kenrick, died at Cheltenham in 1843. Doctor of Civil Laws. Jackson’s Oxford Journal, 7 July 1810. John Shawe Manley. See Burke, also Joseph Foster’s Alumni Oxoniensis. Admiral Isaac. Isaac’s promotions are recorded in the Navy List, also in his obituary. Steamships. The US ship Savannah was the first sailing ship with an auxiliary steam engine to cross the Atlantic to Liverpool in 1819. The Canadian Royal William in 1833 was one of the first to make a trans-Atlantic voyage using steam only (www.curassow.com). The British Great Western began the first regular Atlantic steam service in 1838. Obituary. The Gentleman’s Magazine December 1837. Remarkably, Isaac’s obituary manages to confuse him with somebody else. It wrongly says he commanded the frigate Apollo that captured a French corvette in 1796. This was based on Isaac’s entry in Marshall’s Royal Naval Biography of 1823; but it was a Captain John Manley (no immediate relation) who commanded Apollo, verified by the ship’s muster book (Adm 36/15190). Isaac’s memorial plaque in Checkendon church does not make the same mistake.